The Fall semester is in full swing here at Kent State University, and I have the work load to to prove it. As I’m sure you have noticed, this fact is reflected on our site here as my already sporadic posting record has become increasingly infrequent. If you have read the About page, or even better: The Inaugural Post, you would have a good idea as to why the AiG site does not conform to your typical regular schedule of postings. I do apologize for those of you shaking your fists in the air right now, and will try to keep my posting as regular as possible throughout the school year. On the positive side, you are currently reading a new post, and one with a little substance! While I may be bogged down with plenty to keep me busy between my coursework, teaching duties, master’s thesis research and regular work as a geologist for an environmental consultant, all of this does not keep me from getting out to explore the world of geology. Last month was a good example, and one which is exciting to me not only because it allowed me to look at some local geology, but because it presented an opportunity to teach students about the subject and open their eyes to what is all around them. Students being led through the park. These large blocks have separated from the rest of the rock unit via joints and are slowly moving downslope. Our trip was to the Cuyahoga Valley National Park, home to Ritchie Ledges at Virginia Kendall Park, in Peninsula, Ohio. The field trip was set up as an optional field trip for the students of our Earth History course (an entry-level geology course) and is located less than a half hour’s drive from the University. 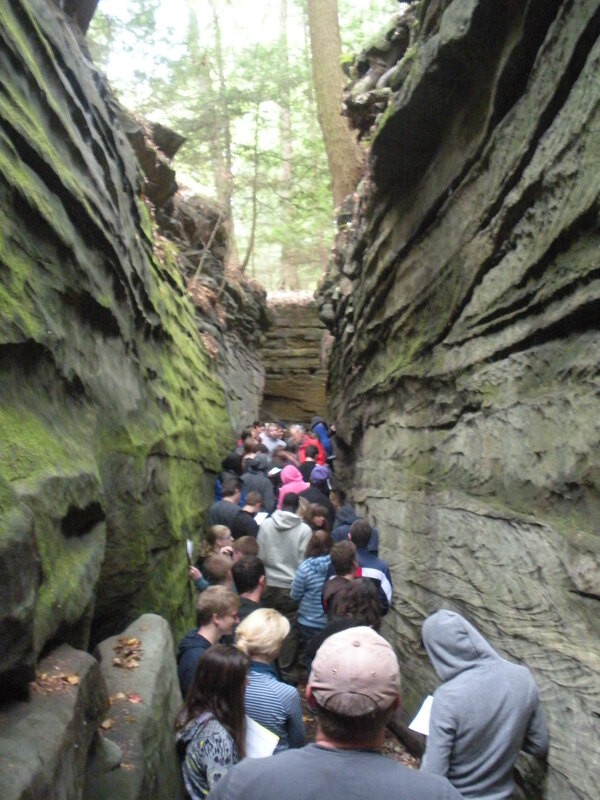 With close to 50 in attendance, we hiked along the park’s trail into the hemlock forest and down to the base of the sandstone ledges. 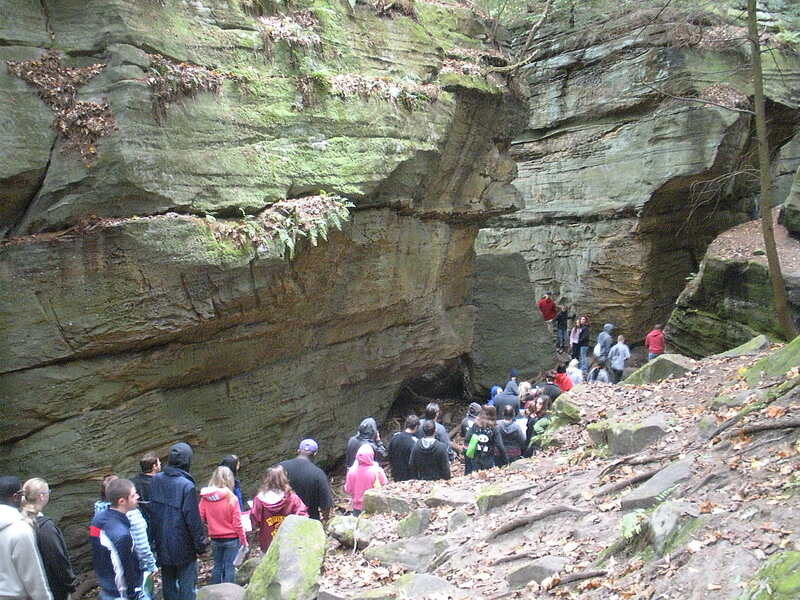 The Cuyahoga Valley National Park encompasses a wide variety of habitats, vegetation, and geological exposures. The CVNP happens to be one of the best places to see outcrops of the Sharon Conglomerate, an aquifer which is nearly 100% quartz sand and gravel grains (with a limonite cement) and one of northeastern Ohio’s primary sources of drinking water. The Sharon Conglomerate was formed about 310 million years ago during the Pennsylvanian age by shallow, braided stream like that of the Platte River. Sediments eroded from what is now New England and Canada were transported by rivers which flowed toward Ohio. As the rivers approached the sea which, at the time, was located here in Ohio, they began to lose the energy required to carry sand and gravel-sized sediments. These sediments were deposited here, leaving behind numerous sand and gravel bars which provided the sediments that were lithified to create this rock unit. Because the Sharon Conglomerate is somewhat resistant to weathering, it has formed steep ledges in many locations. Obviously Ritchie Ledges has earned its name in part for this reason. Interestingly enough, the outcrops in this location are primarily sandstone with small conglomerate lenses here and there. In fact, the Sharon Conglomerate is actually mostly comprised of sandstone. The people who named the rock unit must have been in an area where the exposures were near its base, where it is actually more of a conglomerate, or where there were many of the conglomerate lenses that speckle the ledges. Our trip focused on the many sedimentary features preserved in the sandstone ledges within the park. These features included cross-bedding, buried river valleys (represented by the gravel lenses), and the occasional ripple marks. Other interesting features are joint sets (some of these cracks are large enough to walk through!) and the somewhat mysterious honey-comb weathering patterns. Walking through a valley stress relief joint. Some cross bedding is visible on the right. The students took interest immediately and were challenged by many questions in which they were asked to interpret the features they were seeing and how they formed – differential weathering of the limonite cement caused the honeycomb patterns in the rock, tectonic stresses and valley stress relief resulted in the very straight and vertical joint sets, etc. I made attempts to take some good pictures of these features. However, being a novice photographer with a simple point-and-shoot Nikon, most of the close-ups of cross bedding, honey-comb weathering, and gravel lenses did not turn out. The joints were hard to miss, and you can catch a few of the other features in these pictures if you look for them! 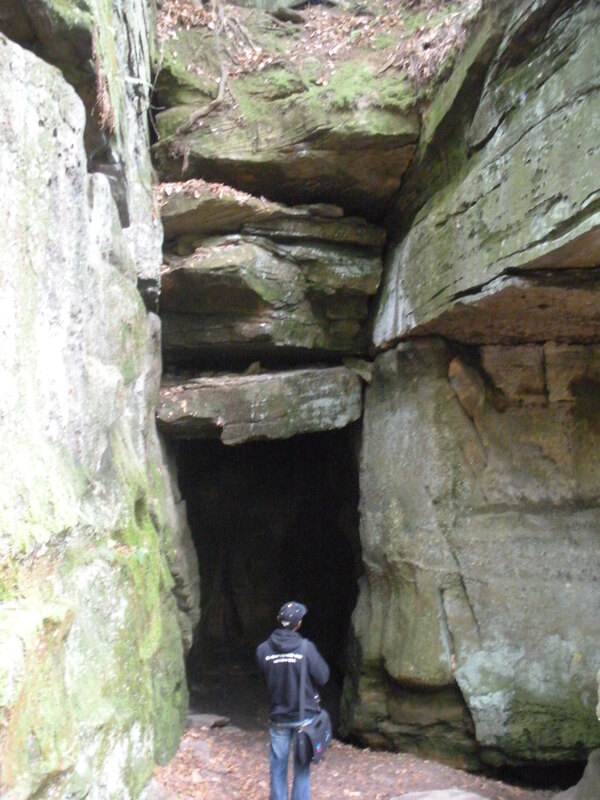 Icebox Cave. So named for the year-round cool temperatures - just a couple meters in and it is about 10-15 degrees F cooler. I like this picture because the blocks formed by the joint sets resemble a face. Another trip I attended last month was to Charleston, South Carolina, where the Association of Environmental and Engineering Geologists (AEG) held this year’s annual meeting. The conference included many technical sessions including landslide and rockfall mitigation, seepage and piping problems at dams, plenty of contaminant remediation, and even sessions on the future of engineering geology (outlooks are good!). Additional events were poster sessions for students and professional companies, field trips, and networking, networking, networking. All of this in beautiful Charleston, SC! While I could elaborate, I think I’ll save this for a post in the near future. Maybe this way you won’t have to wait another month! I’m responding here so that everyone can take advantage of these sources. I must add, though, that I learned much of this information through my classes and by attending these trips as a student myself (it’s been a while), and only used a few reference materials to fill in the blanks. My primary external source was a field trip guidebook titled “Pennsylvanian Sharon Formation, Past and Present: Sedimentology, Hydrogeology, and Historical and Environmental Significance” by Annabelle M. Foos, et. al. I could not find a year on this, but based on some of the other authors, 2003 (found it through google scholar here: http://bit.ly/OAZqpe). You could always look up info on the NPS website (http://www.nps.gov/cuva/forkids/park-geology.htm) which can be pretty basic, but give you a good place to start. You can also see a little more info on a couple other posts here on AiGeology: “Backyard Geology” & “When Rain Falls, Landslides!” (just copy and paste these titles in the search bar). I hope this helps. If you can’t find a copy of the guidebook I mentioned, use the contact form and send me a message. I’ll try sending a scanned copy (if you don’t mind terrible image quality). Thanks for visiting! Come back and scan through the site some more, and share it with your students! There’s lots of posts that should eb pretty interesting! p.s. – I removed your email address from your comment to protect you from spammers.